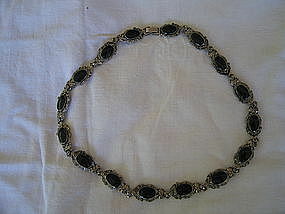 Vintage necklace of faux jet in heavy silvertone metal. There is no manufacturing information. 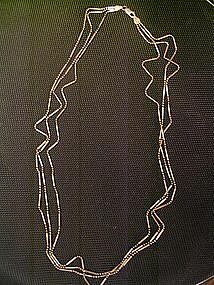 It is 18 inches in length and each link is 1 x 1/2 inches. There is minor finish wear. I have additional photos by email. I need your zip code to calculate the postage. 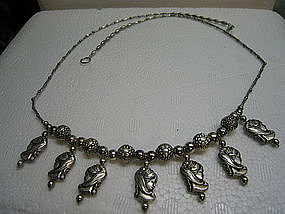 The necklace is marked Milor Made in Italy 925. 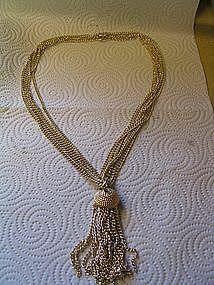 It is a 3 strand style measuring 24 inches. 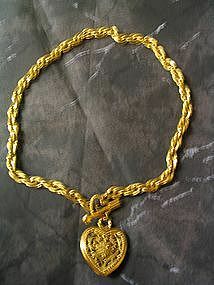 There is no damage and the clasp is secure. Additional info or photos by email. I need your zip code to calculate the postage. 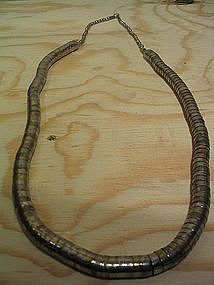 Vintage 36 inch necklace. There is a tiny Sarah Coventry hang tag at the closure. The stringing cord is brown tinted which is always a nice touch. The closure is secure. No real damage other than a few places on the side of some of the beads from clicking together in the jewelry box. I will be happy to answer any questions or provide more detailed photographs. I need your zip code to calculate the postage. 19 inches. 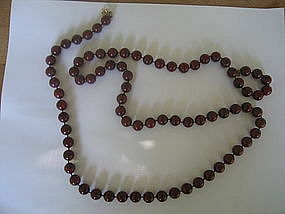 Wooden beads with metal gold tone separaters. Very little sign of use. I will be happy to provide additional phootos. I need your zip code to calculate the postage. Marked Trifari without a crown. 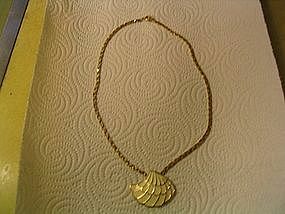 It measures approximately 16 inches when clasped and the shell is 1 1/2 inches. The fan is soldered to the chain. There does not seem to be any problems with this piece. 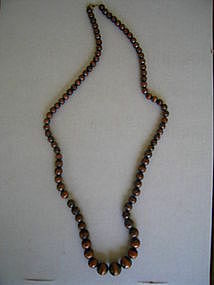 If you have any questions regarding this necklace, please email. I need your zip code to calculate the postage. 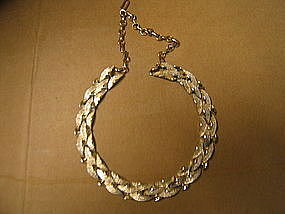 22" goldtone necklace with six strand chain (when clasped). 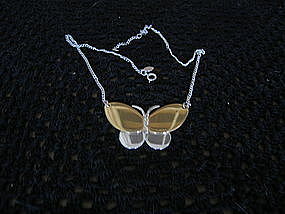 The 4" pendant has a total of 24 separate chains. 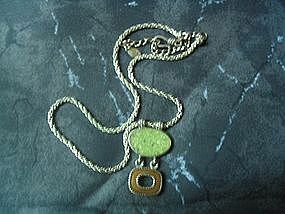 The pendant is detachable. If you have questions, just email me and I'll do my very best to give you necessary information. 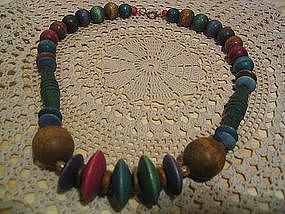 I don't see any problems with this piece, but I will say, it was always one of my favorites and was worn a great deal. I need your zip code to calculate the postage.